Witt Liner, Plastic, 24 Gal. Complete your trash management system with replacement trash bags that fit your trash can perfectly. Made of extra-thick, durable plastic, the trash bags are available in many sizes to fit a large selection of trash cans. 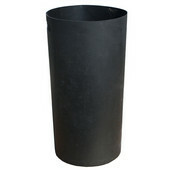 These replacement liners are designed to conform to the inside of the trash can for a custom fit without any overhang, so they offer a clean and tidy presentation. Drawstring closures keep odors and mess inside the trash bag and make it easy to lift and remove the trash bag when it is full. The trash bags come in multiple packs, so you'll always have trash bags on hand when you need them.